Saigon to the Mekong Delta: Mekong Delta is is famous for as Vietnam's 'rice basket’-- a fertile delta spreading around 50,000 sq km. Here the mighty Mekong river ends by splitting itself into nine major tributaries. 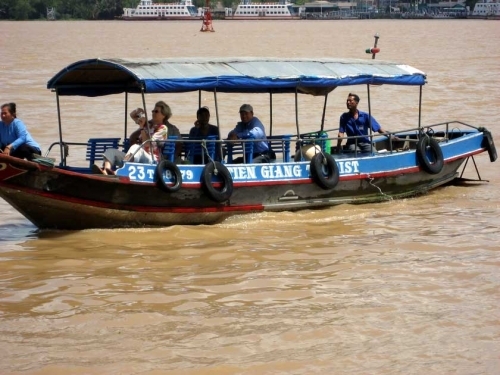 The Vietnamese name of Mekong river is “Nine Dragons.” Here’s our detail itinerary to help you experience local daily activities along the Mekong. Tropical fruits garden + bee farm + coconut candy workshop and cannal. Folk music - motor and rowing boats. In the morning: private car/Van pick you up at your hotel and travel to My Tho, start Mekong Delta Island 1 Day Tour ( My Tho - Ben Tre). 9:30am: board a private wooden motor boat to Unicorn Island. On this boat along the river’s bank, you’ll be passing through natural creeks. You will see an interesting fishermen's port,stilt houses. 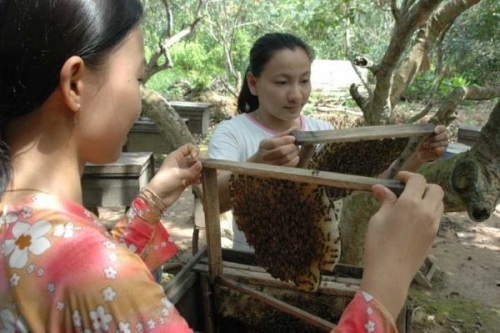 From there, we’ll take you to a bee farm where you have a chance to taste a tasteful cup of authentic honey tea and then, walking around quiet villages and watch rural people going to work. After that, We get on small row boats. 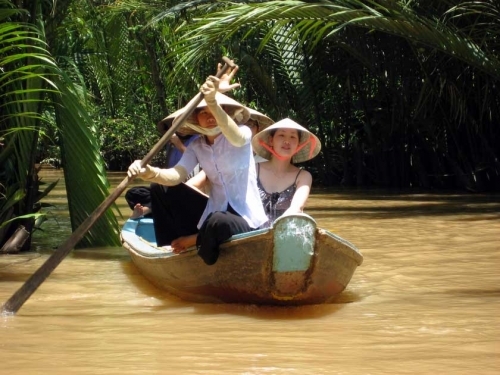 During this 15 minutes trip, you’ll witness all kind of interesting transportation modes that Mekong Delta people use to move around, while enjoying the fresh air along the canal and beautiful water coconut tree scenery. Away from the city, that is it all about! When you feel it's enough for the serenity, let's get back to the large motor boat for something different. You'll pass through a canal whose 2 long sides are orchards and . Then, we’ll take you to a village where you can smell the flavor of coconut candies being made many yards away. 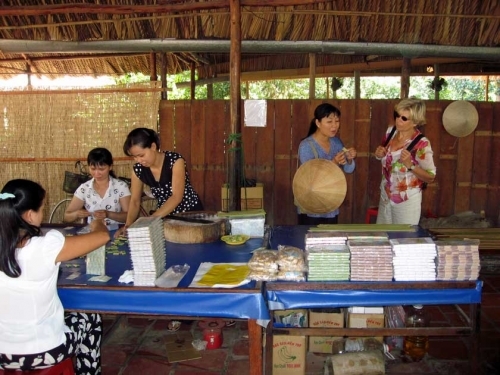 To satisfy your curiosity, we'll get you to small shops that make coconut candy and handcrafted items from coconut trees of Mekong Delta. The time now should be around 12 noon. Time for lunch! Let's go back to restaurant for that. 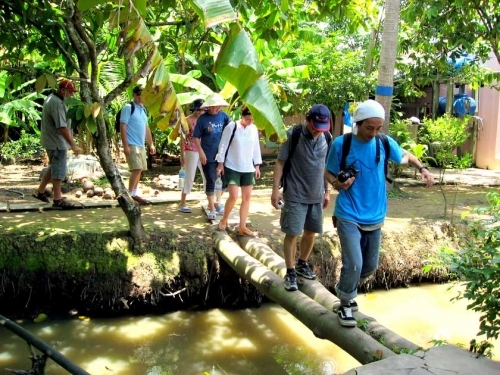 One of the boat’s stops during this trip is at a large orchard that has many different types of tasty seasonable tropical fruits for your enjoyments. You can enjoy the fruits for free while checking out the folk music that is typical to only the people in Southern Vietnam. We end our sightseeing trip. On the way back to Saigon by bus, we'll have a stop at an interesting point to rest and also have photographs (if time permits). As Mekong Delta One Day Tour (My Tho - Ben Tre) ends, you will return Saigon by Private car/van at 6.00pm - 6.30pm. Private air conditioner high quality Car/van, English or French speaking tour guide, private boat trips (motor and row boats), entrance fees, 01 special lunch - Elephant eared fish, fruits, honey tea, 01 water bottle /pax. Tips, drinks, travel insurance and personnel expenses. 1.Print your voucher; locate the voucher in your travel confirmation e-mail or in "show ticket" link on the site and show the voucher to guide. 2. Please provide name of hotel and hotel address in Dist 1, HCMC, Vietnam where we can be free pick-up & drop off. 3. Please note that you will choose English or French speaking tour guide.